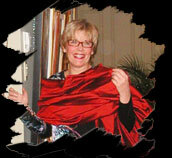 The name Liliane Bruneau certainly evokes fashion! But she has gone above and beyond the quest of opening a warm and inviting boutique. This woman wanted to bring her own personal touch to the boutique. Fashion has brought all her passions together: music, art and philanthropy. Liliane's imagination is without limits and she uses it to organize varied and original activities. You may even discover that behind these social events, the human cause has always been at the forefront. Liliane Bruneau's involvement has played an important role on the scene. In 1997, there were three large-scale events to benefit the Canadian Cancer Society. Not one, not two, but three events! That is very typical of Liliane Bruneau. Through this foundation, Liliane Bruneau has found a way to be useful to the community. It's a brilliant way to combine purpose and enjoyment. Thanks to this involvement, several associations and organizations will receive the funds needed to bring their projects to fruition. There are those who have "the art of receiving". In Liliane's case, it can be said that she has "the art of giving". To date, Fondation Liliane Bruneau has donated over $135,000 to various organizations in the region.